Our days on the Loop are quite lazy. Sleep in, then start off with a nice and late, relaxing breakfast at our inn, watching the sparse morning traffic pass by us. Then mosey on down to the bikes in the parking lot to pack up for the day's ride, which is probably going to total less than 150kms. We probably won't leave till just before noon! 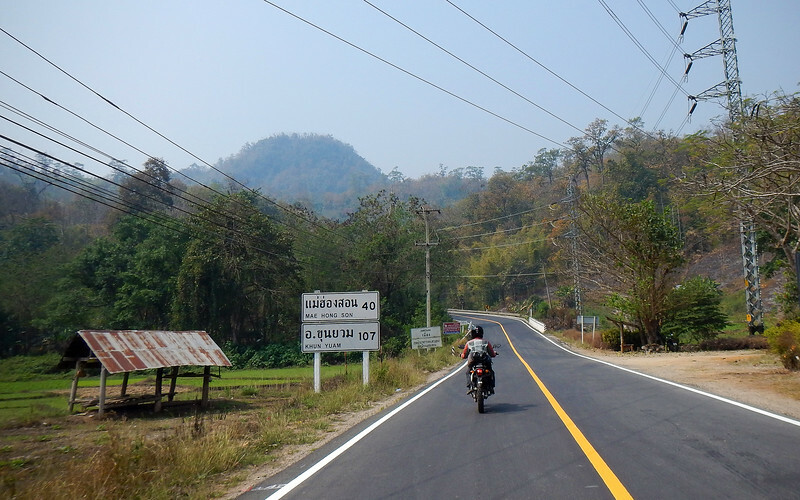 Today, we're heading further west towards the actual city of Mae Hong Son today. 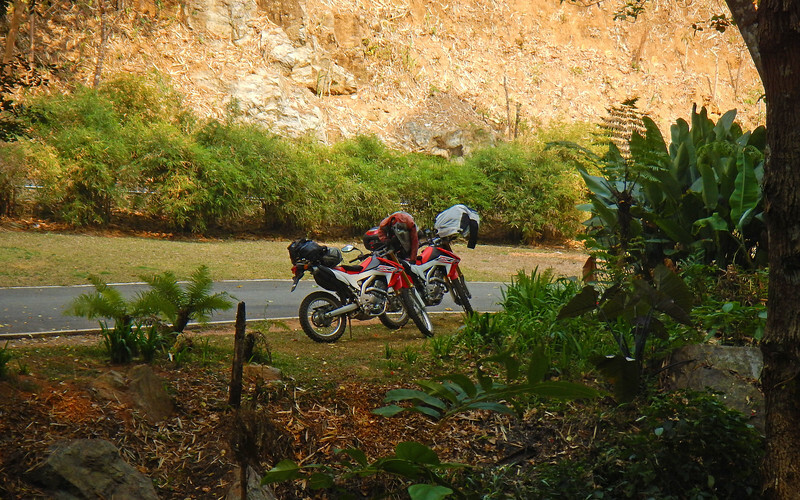 The rhythm of packing up, moving on, then unloading the bikes is quickly becoming familiar again, like muscle memory. This is version 2.0 of our pack'n stack jobs. There's a lot of movement in the luggage behind us while riding. The bungie cords and bungie nets just aren't secure enough, so we ditched them. Good thing I remembered that we brought Rok Straps with us from Europe. We love these things. They cinch down nice and tight and nothing moves behind us now! I like that our bags don't make our bikes wider. We're really getting used to filtering past stopped cars in traffic and big panniers wouldn't allow us to do that as easily. Although we both still miss the comfort and power of our GSes, we love how we are able to squeeze and maneuver these smaller bikes in the tiniest of spaces, in traffic and also when parking. 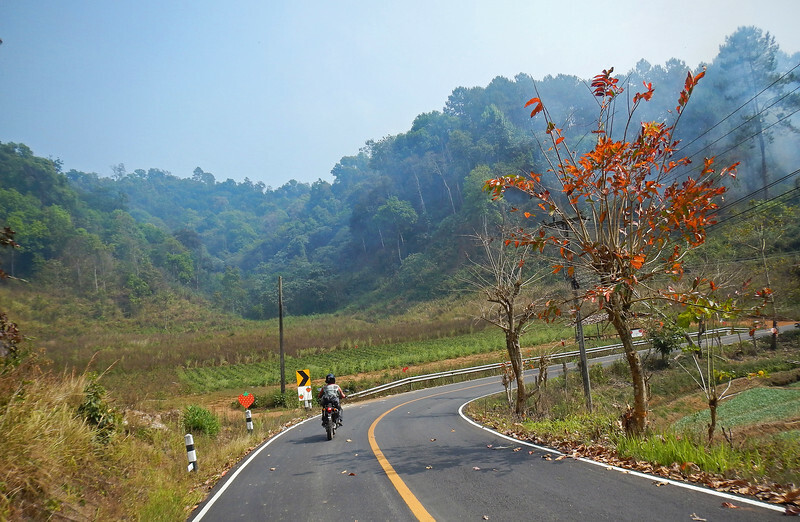 Although the twistiest part of the Loop is behind us, there is still enough entertaining curves in the road to keep our throttles happy, as our motorcycles cut their way through the dense jungles of NW Thailand. The temperatures up here in the mountains are perfect for riding, we just need to talk to someone about this damn haze! 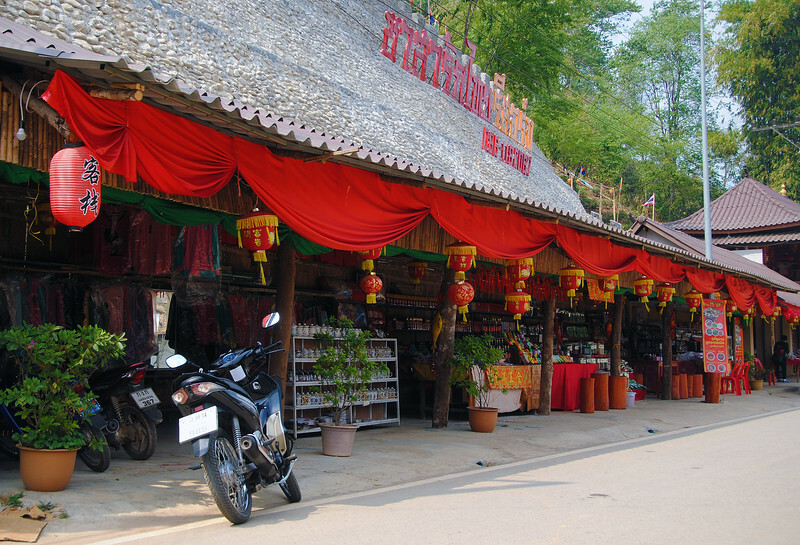 We're going to pay a visit to a small village called Ban Rak Thai. Neda read up about it and told me that it's a Chinese Tea Village. 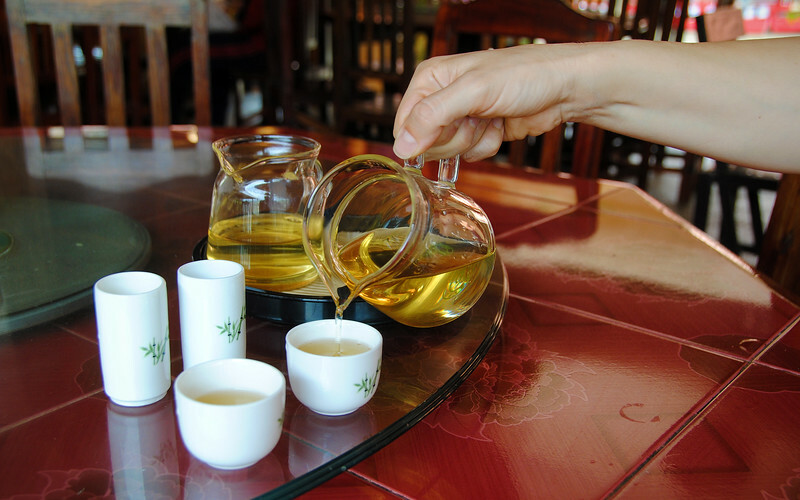 Neda is a tea connoisseur, so we have to go and take a look around! 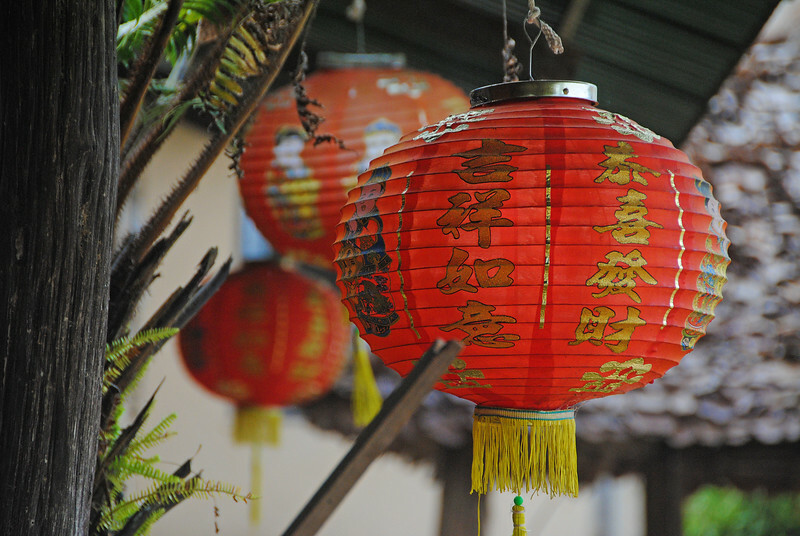 There are Chinese writing and decorations all around town! 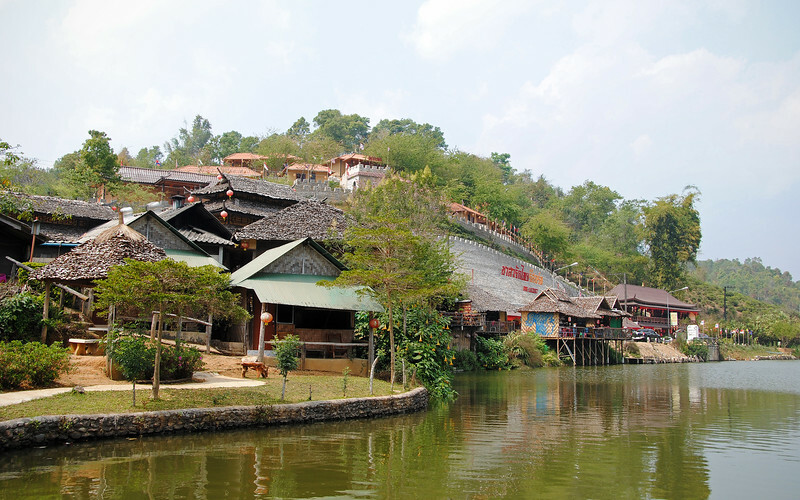 Ban Rak Thai is not that large, about 1,000 people, most of them of Chinese descent. They arrived here shortly after the Chinese Civil War which ended in the 1950s. 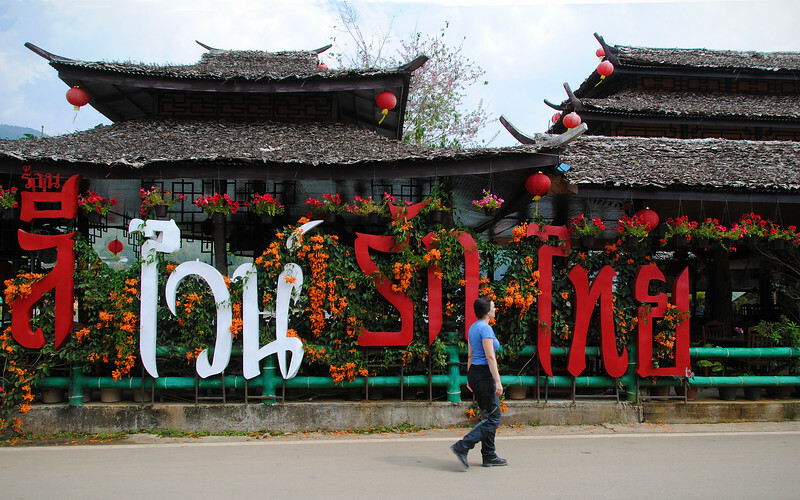 The previous ruling party in China was ousted from power and fled to Northern Thailand. 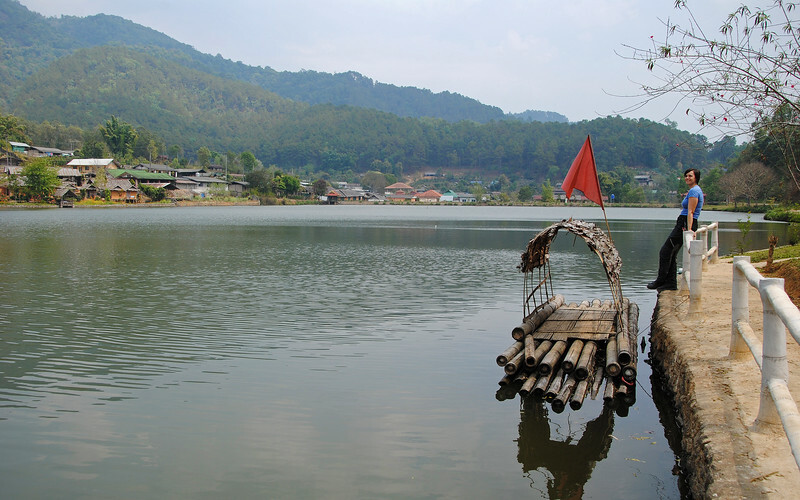 Some of them set up in the mountains around here, and the biggest trade back then was running opium and other drugs across the Burmese border. 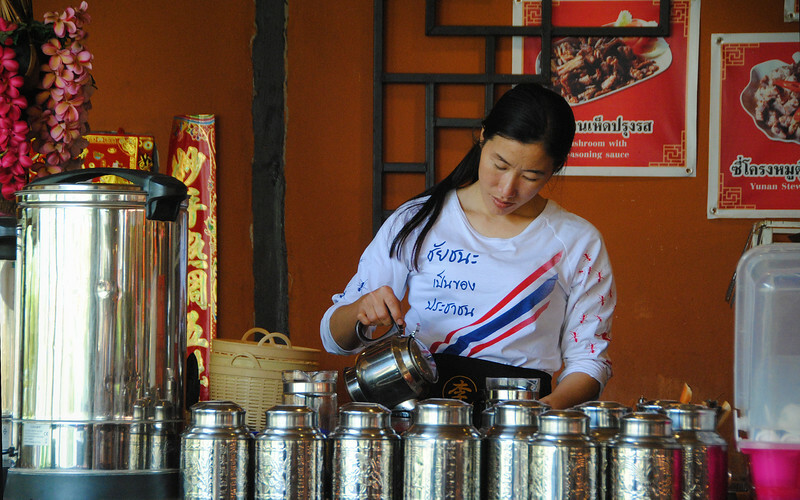 Nowadays, tea is what Ban Rak Thai is famous for, drawing tourists in to sample the brews from different tea plants that grow in the area and also to eat some Yunnan food in the restaurants, brought down from the south-west region of China. 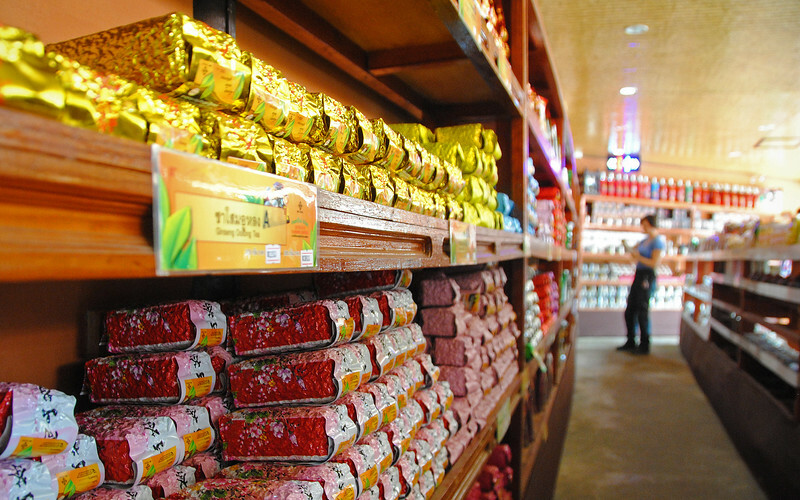 Neda is perusing all the different types of tea they sell in the stores. They are packaged like bars of soap! The lady who worked there gave us some free samples! 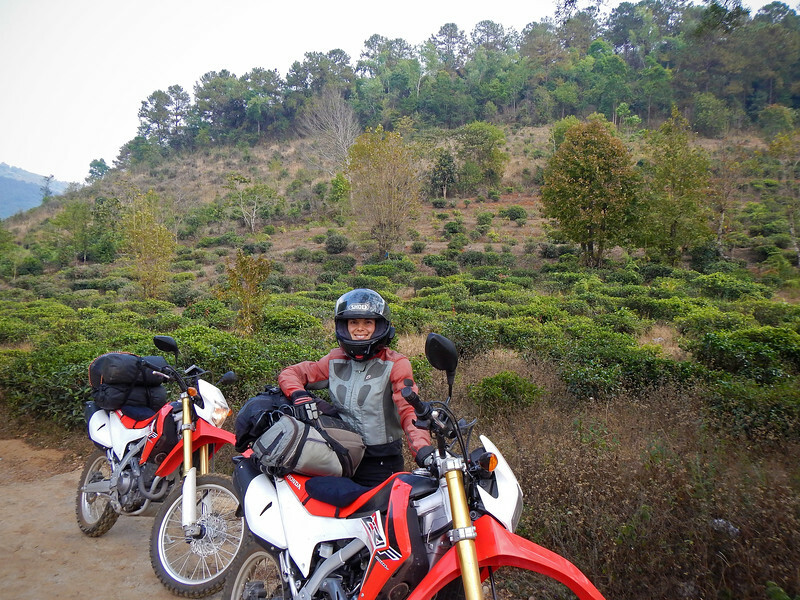 Riding around the tea fields, we are just a few kms away from the Myanmar border! 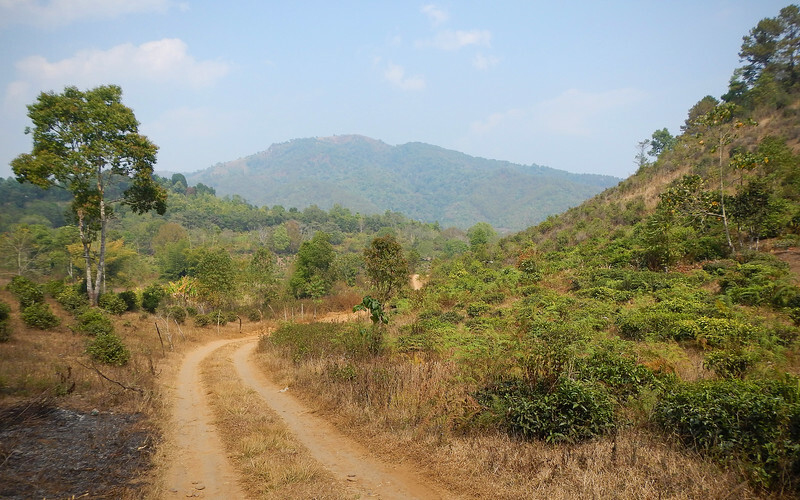 After playing around the the tea fields, we turn back south towards the main road to Mae Hong Son. Did I mention the smoke here is really bad? 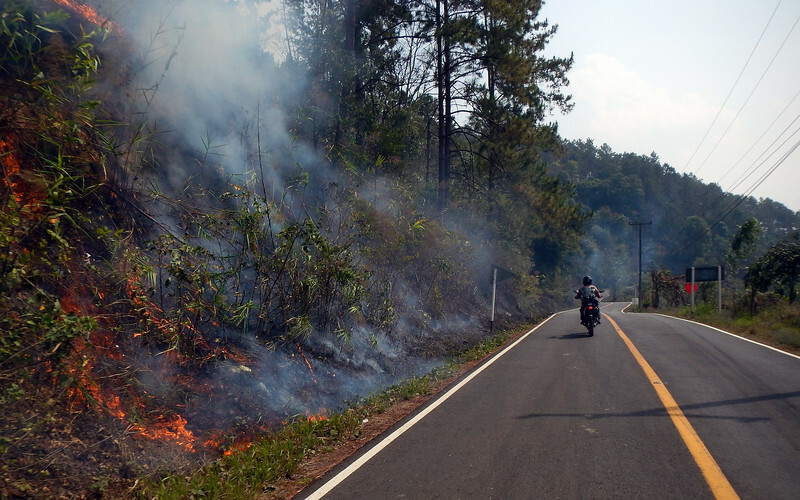 This is not farmers burning their fields, this is just the Thai way of maintaining the grass by the side of the road. We saw this in Latin America as well. Saves them from having to cut the grass. 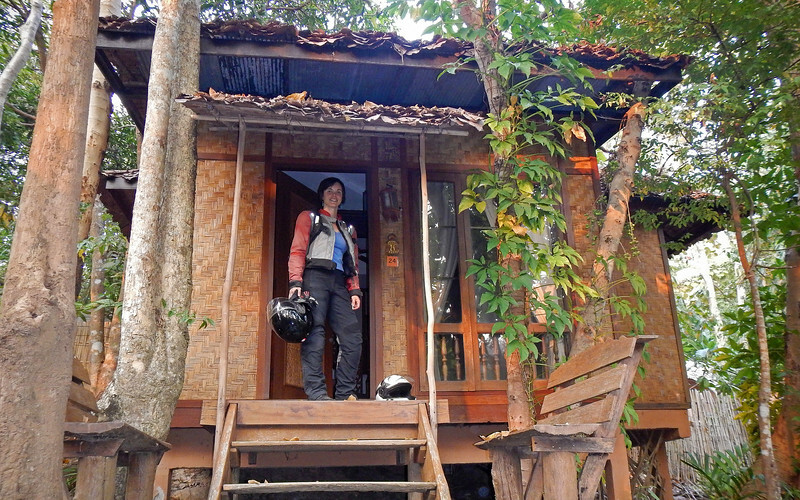 I usually carry a small camera in my tankbag on my GS, which I can quickly bring out and stash while riding. That's how I take all the riding shots. 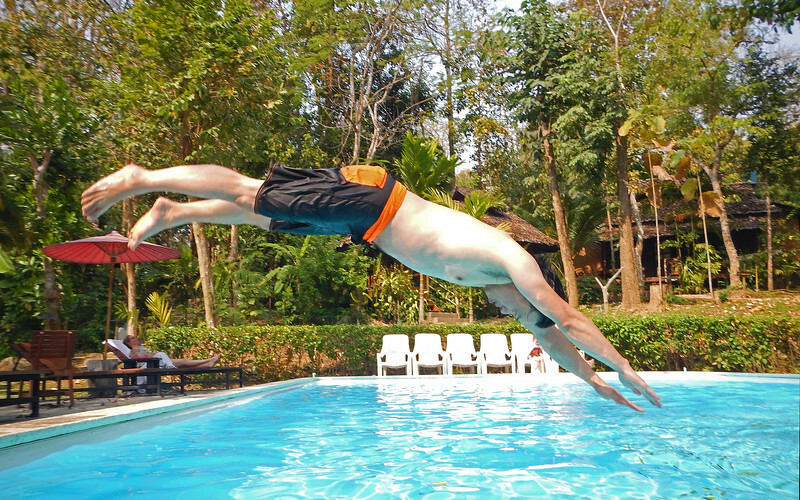 However, here in Thailand, I didn't want to buy an expensive tankbag for the Honda, so I picked up a cheap bumbag which I use to keep the camera in. 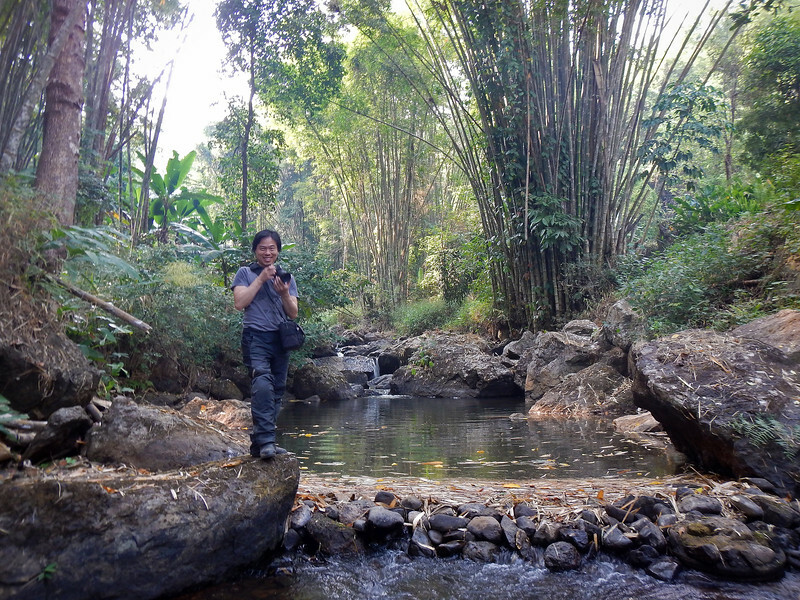 When I'm done taking pictures, I just drop the camera into the bag and leave the zipper open. The bumbag is not as secure as a tankbag, and as I was riding I could feel the camera come out. I swear I thought I saw a flash of blue bouncing behind me in the mirror, so I stopped the bike and radioed ahead to Neda to come help me search the side of the road. 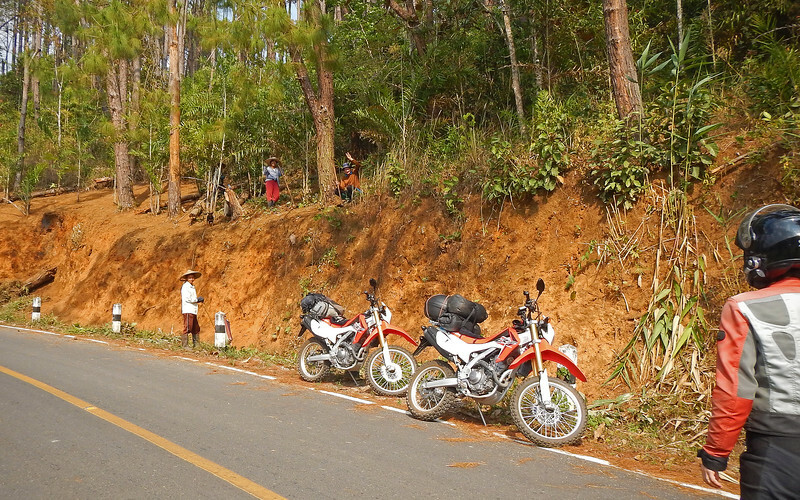 We must have spent close to an hour riding slowly up and down a 2-km stretch of road, scanning the ditch where I thought I dropped the camera. In the end, it wasn't where I thought it was. 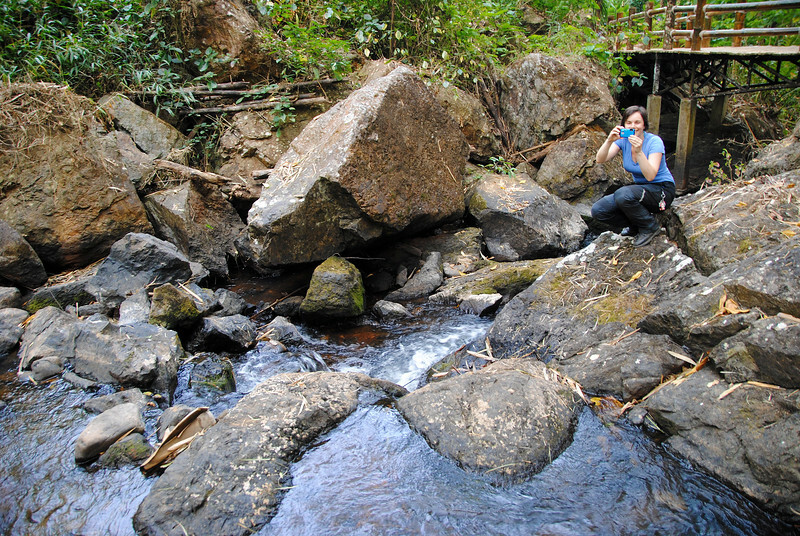 Neda found it about a hundred metres ahead of where I originally stopped. It must have bounced or slid down the road past me! on where to look for my camera. When we found it, they gave us a thumbs up! :) They were really friendly! I took this picture of them with the camera just to make sure it still worked! Yay for shock-resistant cameras! 555! I hate losing stuff. Especially since we don't own a lot of things, so everything we carry with us is something we use everyday. And most of our gear was specially ordered, not easy to find in local stores, even in Canada. I was soooo happy Neda found my camera! I will voluntarily turn in my motorcycle key if you ever catch me wearing fluorescent yellow non-rain gear. 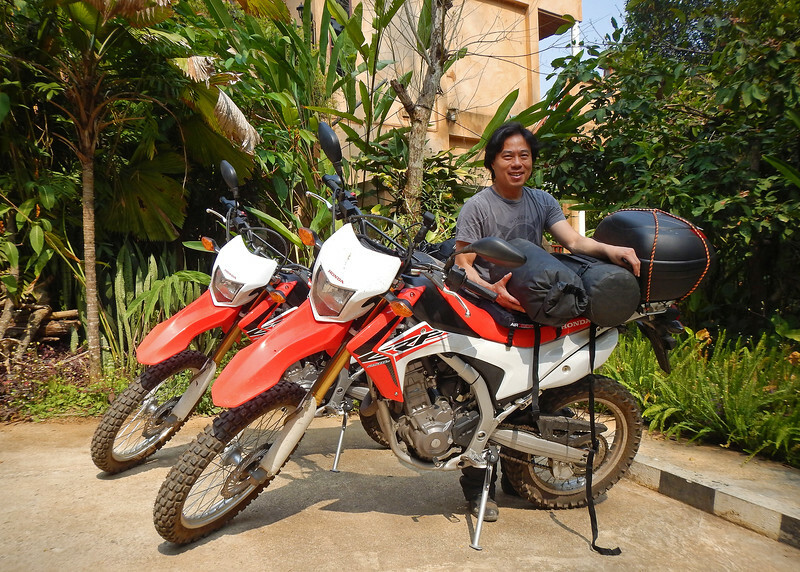 When we first got these bikes, I was all over the Internet forums researching modifications: Aftermarket seats for more comfort, Electronic Jet Kits to coax more power out of the engine (but get less mileage), panniers, tankbags, etc. 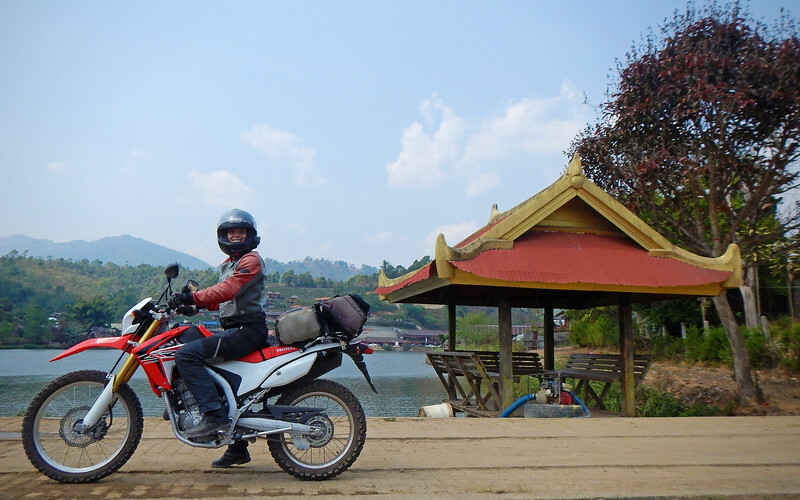 But these might not be our long-term bikes if we can manage to bring our Beemers into Thailand, so I don't want to keep throwing money at them. 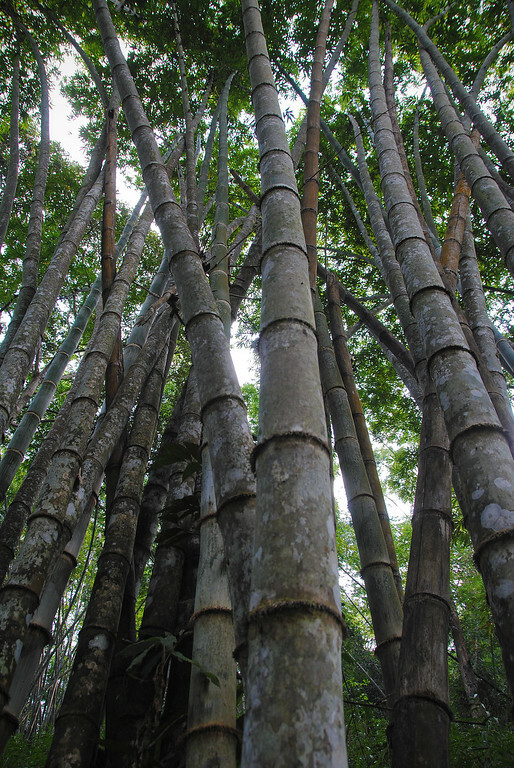 Oh yeah, here are the bamboo trees! 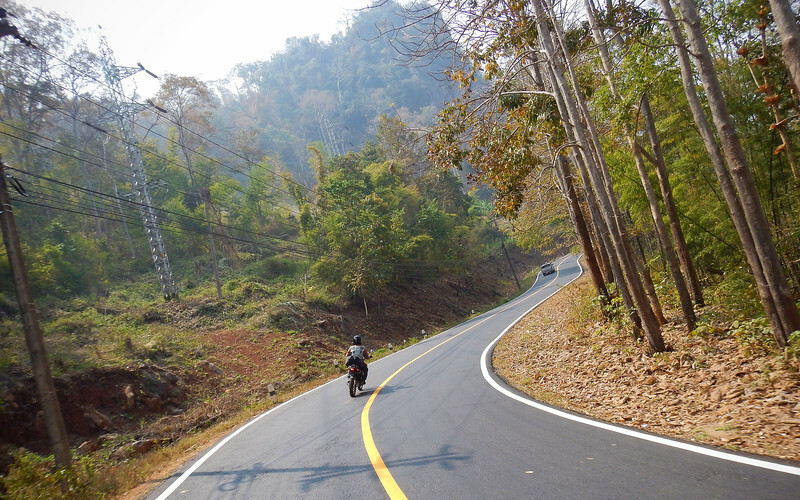 We eventually reached Mae Hong Son. It's a fairly big city and we rode right through it, stopping only for gas and to do some chain maintenance on the bikes. Well, Neda did the chains, I just helped rock the rear wheel off the ground on the sidestand and watched from above because she has more experience than I do. "Lube the chains? 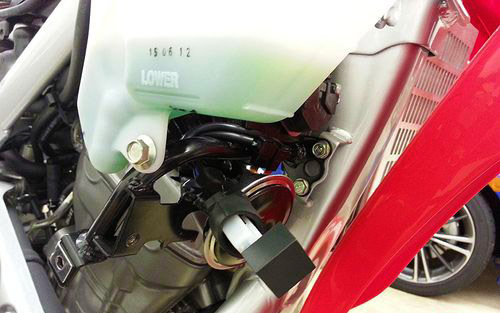 Don't all motorcycles come with shaft drive these days?!?!" 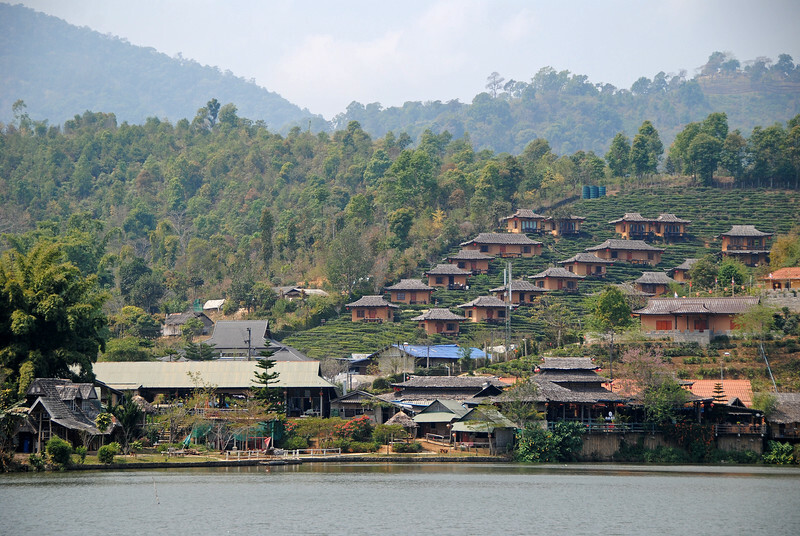 We're staying in a really nice resort just outside of Mae Hong Son because all the hotels in town were fully booked. Although it may look rustic on the outside, it was so luxurious inside! 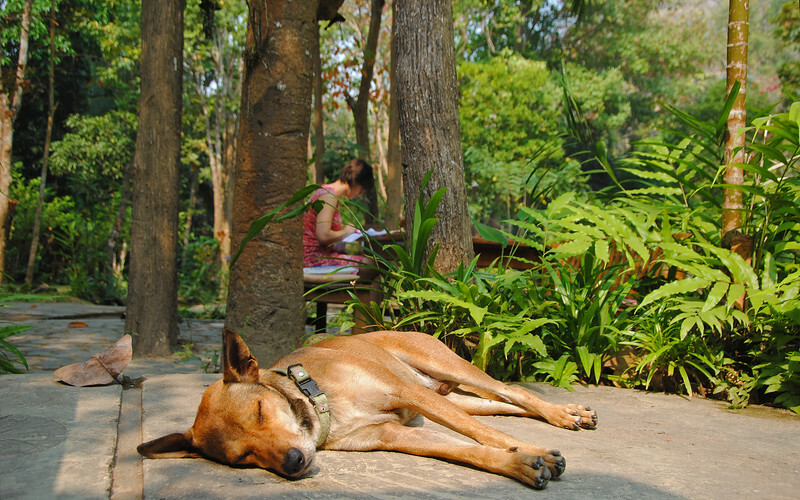 Everywhere we went, these hotel dogs followed us because we were the only guests to play with them and pet them. Neda's working on a new cross-stitch, BTW. I'm still pretending to work on the blog. But really I'm doing this.